Living and working in the tropics is a real treat. It never seems to amaze me of learning new things that just put you in a position to think "Good Gosh, Nature is amazing...". When doing a tour one of the first things as a nature tour guide in the tropics is to let people know that that tropics is a war-zone of different animals and species of plants all fighting for energy from the sun and other sources of energy in and around the rainforest. A butterfly lays it's eggs on plants and then when the larva hatches from the eggs it starts to feed off the plant that it's egg was sitting on. It is sort of like giving birth to a baby in an all you can eat buffet and the baby just staying at the buffet eating and eating. They say that pretty much is what butterfly larva is "Eating Machines". Ants in many parts of the rainforest have a symbiotic relationship with plants. What does the word symbiotic mean? Symbiotic is a close relationship between two species of benefit or dependence. 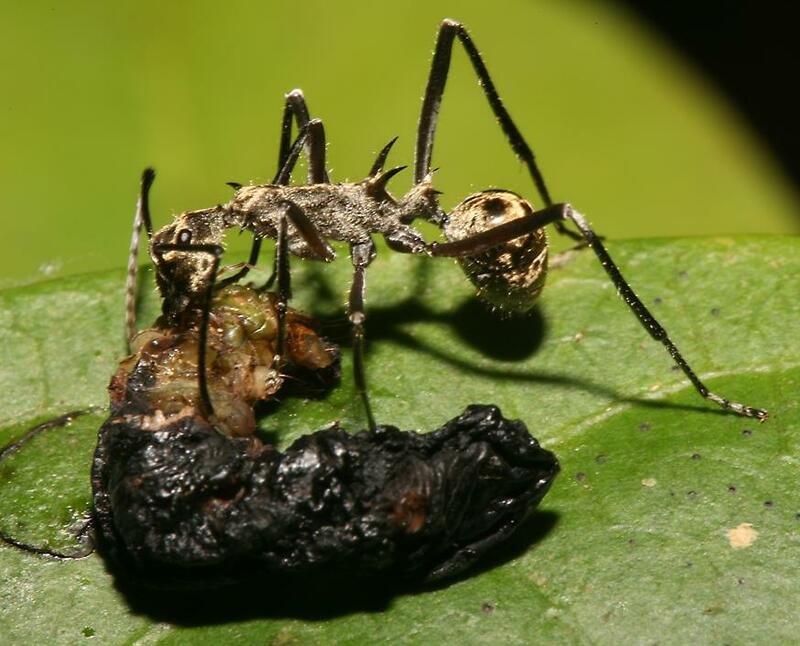 In the rainforest the relationship between the ant and plant in many cases is symbiotic. The ant feeds on the plant at extra-floral nectaries which are basically sugar that the plant is producing for the ant. It is in the best interest of the ant to protect the plant because the plant is the food source for the ant. In return the ant protects the plant from predators. This is where the plant and butterfly larva come to meet each other. If a butterfly lays its eggs on a plant that has this symbiotic relationship with an ant species than you can expect the ants to destroy the eggs before the larva has the chance to hatch and start eating the plant would could cause the plant to die. There are many plants in the rainforest with symbiotic relationships with ants. So what can the butterfly do so it does not have it's eggs eaten by ants? Well the butterfly has had to adapt to laying it's eggs on the tips of leaves where the ants do not visit. When the eggs are place here they are less likey to be discovered and disposed of by the ants. The butterfly also in recent studies has developed a smell that it releases from it's abdomen that tricks the ants into thinking it is really ant larva. Nature just keeps going and keeps adapting to whatever it might be. Now that is some interesting stuff how nature just continues to adapt to it's surroundings. Interesing in seeing and learning about Nature in the Tropics?